Tootsiebubbles is a delightful line of designs that celebrates all the special little ones in our life. “Tootsiebubble” was a term of endearment that my grandmother always used for the special children in her life. 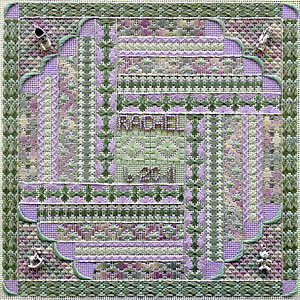 Shades of green with a hint of blue and just a smidgen of lavender spin around the canvas in this fun new design. There’s just enough copper ribbon to make it sparkle. 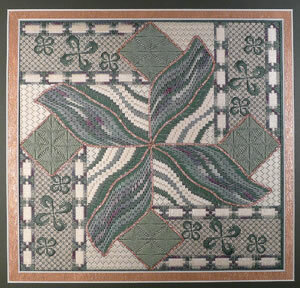 Bargello, Sprats Heads and Amadeus create this spinning motif. Approximate finished size of the design is 10” x 10” when worked on 18 count canvas. Share the joy of the birth of that special little one with a medley of baby blocks. Personalize with the baby's name and birth date and coordinate the colors to the nursery. Charms can be chosen to match the decor. Soothing pastels are worked with Rainbow Gallery Bravo and Splendor Silks. Small animal charms adorn this quaint Noah's Ark. Soft pastel Impressions thread creates the sails, while Splendor Silk makes the ark shimmer. This design works quickly and is designed for the beginner/intermediate stitcher. A new little Tootsiebubble has joined our family. Her name is Alivia Grace, and we couldn’t be prouder! Have you ever searched for a birth announcement that your little one won't "grow out of" in a few years?. 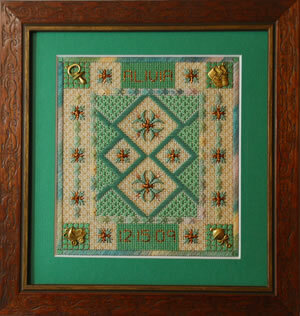 This needlework piece is so much more than a throw-away paper announcement. It is a gift of love and time that can be part of the baby's room decor for years to come. Optional baby charms can be added and removed as you update the piece to grow with the child. Amadeus, Tied Windmills, and Double Cross Stitch combined with Very Velvet and Bravo create a sophisticated design that goes beyond "cute". Copper metallics and charms add sparkle. Pebbly Perle, Bravo and Very Velvet add texture. 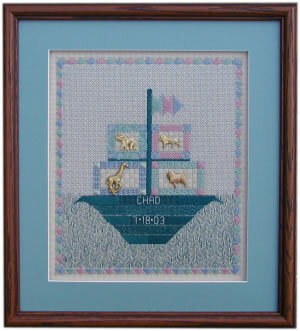 You add the baby name and birth date...or stitch it without words for an accent piece for yourself! 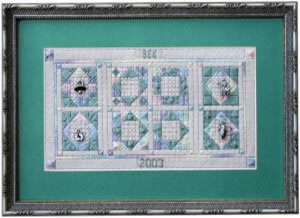 Approximate size of the design is 6” x 6” when stitched on 18 count mono canvas.